10 things you might not know about STAR TREK: The Original Series | Warped Factor - Words in the Key of Geek. Tom Pheby begins a new weekly column dedicated to the long running Star Trek franchise. 1. In Gene Roddenberry's scripts for the early episodes of Star Trek, the USS Enterprise was originally called the USS Yorktown. Possibly chosen by Roddenberry in reference to a World War II era United States naval ship. 2. You may well know that the 'original' Captain of the USS Enterprise shown in the pilot episode was Christopher Pike (played by Jeffrey Hunter), but you might not be aware that in early drafts he was meant to go under the name of Captain Robert April. The pilot episode was later re-edited into the 2-part story The Menagerie, and Pike became a part of the shows canon when he was revealed as the Captain who was at the helm before Kirk. Later on, the Star Trek Animated Series took Gene Roddenberry's original choice of name for the character and added a brand new Captain to the ship's legacy. They revealed that Captain Pike had replaced Captain April (original Commander for 9 years), meaning that Captain Kirk was actually the third Commander of the Starship Enterprise. 3.The Arrow head badge that appears on the shirts of the crew was originally only meant for the Enterprise. The Federation had an entirely different design but later the 'Arrow head' was rolled out across the series. 4. 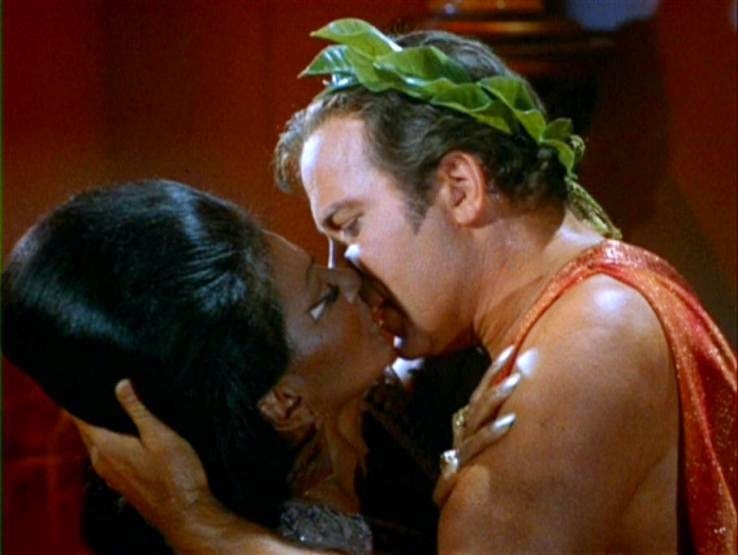 The kiss that took place between Uhuru and Kirk was originally intended to be between Uhura and Spock. Quite ironic as the reboot features the pair romantically. 5.The original series of Star Trek was shown in Japan in the1970's but was taken off after just one week due to very poor viewing figures. Many years later Star Trek: The Next Generation proved to be a big success there, so an attempt to broadcast the original series began once more. But again it was withdrawn, reasons quoted include younger Japanese viewers thinking it was a "poor copy of the original"! 6. The effect of the transporter was created by glitter in stirred water, back lit with high intensity lights and transposed onto the actors positions. 7. Walter Koenig's role of Chekov was created partly so Star Trek had a character who could fill the void left by George Takei whilst he was filming with John Wayne in The Green Berets. 8. Spock was originally supposed to be red or with a red tinge, but this was impractical, requiring the actor to be in make-up for hours on end. Bonus 'pub quiz' fact for you - at one time Spock's first name was to be Edward, after his Grandfather. 9. The studio tried to sell the rights back to Roddenberry after it was thought the series was costing too much money. At the time Roddenberry couldn't afford to buy them. "Beyond the rim of the Star-light, My Love is wandering in a Star-flight, I know, He'll find in Star-clustered reaches, Love. Strange love a star Woman teaches, I know, his journey ends never, his Star Trek, will go on forever." Next week we take a look at some of the actors who were considered for the main roles in Star Trek, and how the show may have differed with them.